Let not video games, Electronic gadgets hijack your child’s play time, they need some physical activity too, right? 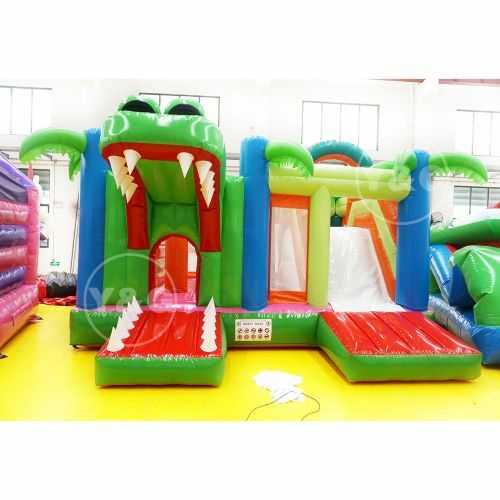 What better way than bounce houses to attract their attention and let them have loads of fun jumping, bouncing, and sliding these gorgeous looking monstrous structures? Children love these inflatable bounce houses because they like to climb, jump and slide.After all, children are naturally active. The inflatable bounce house is gaining popularity around the world because it not only gives your child a healthy body, it also boosts the intelligence of your child and the person who plays with it. Playing on these inflatable structures test not only the physical abilities of your child, but also the mental capacity, their ability to think, balance themselves, and react to get a desired outcome. Inflatable bounce houses come in different shapes, styles, designs, and forms, offering you variety of games to choose. You can select a bounce house that suits the themes of the party you planning to host. Chose aprincess castle, animated characters, bounce house designs influenced by sports or movies, and more. Select the inflatable bounce house based on the theme and the guests to entertain them thoroughly. EnOutdoor activities are essential for both children and adults.Sitting indoors watching TV, playing video games may make your kids introverts, and they may not develop social skills bounce houses are the best ways to invite many guests and have all the kids interact play in the outdoors.However, the modern day kids addicted to video games, cartoons, etc., spend great amount of time indoors doing no physical activity that makes them lazy beings.But,Inflatable bounce houses are great ways to divert their attention from indoor lazing and getting into some rigorous physical activity jumping, sliding, running, climbing these inflatable structures. Playing bounce house games is a great physical activity, is almost like cardio workout that helps your kids burn the extra calories. Such hectic physical activity will help your kids tire and go to bed easily. Early to bed, early to rise makes them healthy mentally and physically.So that's why these inflatable bounce houses are becoming more and more popular.